Abcom LabourGuard is an employee time & attendance recording facility that incorporates features to avoid unintended movement into overtime penalty situations that can so easily occur with Australia’s recent workplace arrangements. 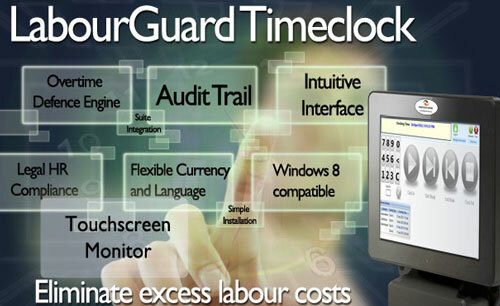 Combining an intuitive, touch screen user interface with our powerful, rules-based Overtime Defence Engine, LabourGuard is simple for employees to use whilst ensuring that they gain the intended benefits of these agreements – however your costs are protected from expensive labour law compliance breaches. Abcom LabourGuard is SIMPLY the most cost effective Time & Attendance solution now available to Australian restaurant operators. LabourGuard is the only time clock that has been designed and approved by Abcom to be 100% compatible with Abcom’s highly successful eProphet Payroll & Accounting system – now in use by almost every Australian McDonald’s owner/operator. LabourGuard’s design criteria also ensures total integration and compatibility with current back office systems such as Abcom’s eProphet.NET back office system (that has now been selected for use in over 30,000 QSR stores globally). Abcom’s back office systems have always incorporated the ability to receive data from a variety of time clock brands and devices. Abcom has over 25 years of experience in integration of multi supplier IT applications such as POS, transmitting of orders to suppliers, downloading of data from suppliers (invoices, product items etc), send/receive integration of data to/from banks, ATO etc. and our capabilities in this regard are now at an all time level of excellence. ¹eBOS was aquired from Abcom's first generation eProphet B.O.S. Learn more about the Abcom LabourGuard Timeclock here.